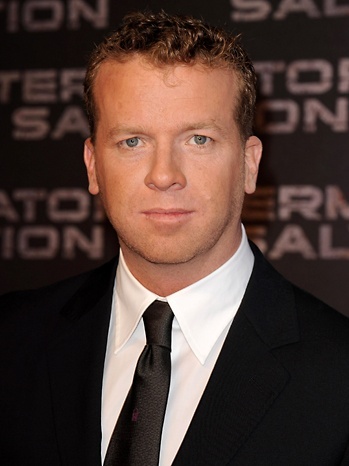 Joseph McGinty Nichol , better known as McG, is an American director and producer of film and television, as well as a former record producer. He began his career in the music industry, directing music videos and producing various albums. He later rose to prominence with his first film, Charlie's Angels, which had the highest-grossing opening weekend for a directorial debut at the time. Since then, he has directed three other films, including Terminator Salvation, and has executive produced numerous television programs, such as The O.C., Chuck, and Supernatural. Joseph McGinty Nichol was born in Kalamazoo, Michigan, and grew up in Newport Beach, California. Because his uncle and grandfather were also named Joe, his mother nicknamed him McG to avoid confusion, which has stuck with him since the day he was born. He had a brother, and his father owned a company that tested drugs for pharmaceutical firms. McG attended Corona del Mar High School, where he met Mark McGrath, initially wanting to become the lead singer of a band he formed with McGrath. However, he failed as a front man and persuaded McGrath to take over, working behind the scenes as producer and marketer for the band, which later scored several hit singles as Sugar Ray. By the age of 22, after he went to UC Irvine and earned a Bachelor of Arts degree for psychology, Sugar Ray signed onto a label and began touring. Around the time, McG worked as a still photographer, shooting local bands and musicians. This led him to form a record label known as G Recordings in 1993. In 1995, McG produced Sugar Ray's first album and co-wrote several songs on their second, including their smash hit "Fly." His music career included directing over fifty music videos, such as Smash Mouth's "All Star" and The Offspring's "Pretty Fly ", and Basement Jaxx's "Where's Your Head At?" and directing documentaries on Korn and Sugar Ray. In 1997, he was awarded the Billboard's Pop Video of the Year Award for Smash Mouth's "Walking on the Sun" and the Music Video Production Association's Pop Video of the Year Award for Sugar Ray's "Fly." Eventually, this landed him in the television commercial business, directing advertisements for Major League Baseball and Coca-Cola. A notable one was a commercial for Gap, which was honored at the 1999 London International Film Festival. Impressed with McG's music videos, Drew Barrymore approached him about directing a Charlie's Angels film. He accepted, wanting to take on bigger projects, and pitched the movie to the studio executives, who were initially reluctant but later approved the project after much persistence. Being paid $350,000, the film was released in 2000 and went on to gross over $250 million worldwide with mixed critical reception from critics and fans alike. However, he won the Hollywood Breakthrough Award at the 6th Annual Hollywood Film Festival held in 2002. Proving himself to be quite bankable, Sony paid him $2.5 million to helm Dreadnought for Red Wagon Entertainment, a military action-drama following the captain of a small ship as he attempts to save the survivors of a shot-down commercial airliner and evade the captain of the Dreadnought, a technologically advanced and heavily armed ship, that tries to cover up the incident. He was also set to develop a sequel to Charlie's Angels and present his film producing debut with Airshow, the latter of which has yet to be made. Afterward, in February 2002, Jon Peters and Lorenzo di Bonaventura attached him onto the fifth installment in the Superman film series that was in development hell, thus putting his previous projects on hold. McG and Peters hired J. J. Abrams to pen a new script for the film entitled Superman: Flyby, which was submitted in July 2002. Bailing out of the project in favor of Charlie's Angels: Full Throttle in September 2002, McG was replaced by Brett Ratner. Meanwhile, he developed and co-created a television series with John McNamara called Fastlane , which was eventually canceled after one season due to the high costs of each episode. Josh Schwartz approached him and his producing partner, Stephanie Savage, about another television series as well, The O.C. , which revolved around the lives of several teenagers based in McG's hometown of Newport Beach. McG was set to direct the Pilot, but because of scheduling conflicts with Charlie's Angels: Full Throttle, he was replaced by Doug Liman. The show ended after four seasons in 2007. The sequel to Charlie's Angels followed in 2003, and although not as successful as the first, Charlie's Angels: Full Throttle also made over $250 million worldwide. Shortly thereafter, Sony extended its first-look production deal with Wonderland Sound and Vision for an additional three years, with Hot Wheels, Airshow, and Radiant on their film slate. Since then, none of those films have been developed, with the former, which was previously supposed to be a directing vehicle for him in 2003 , being put into turnaround in 2009. Warner Bros., still satisfied with his bankability, re-hired him to direct Superman: Flyby in April 2003 after Ratner had dropped out due to casting and pre-production difficulties. During his tenure, McG and the producers spent more than $15 million planning storyboards, concept art, and locations, as well as having script revisions and the film completely pre-visualized. However, McG later left the project, citing his fear of flying to Sydney, Australia. This eventually brought Bryan Singer on board in July 2004, resulting in Superman Returns. McG produced the television series, The Mountain , on the same year, also getting canceled after one season. His next television work was Supernatural , for which he serves as an executive producer. The show centers on two brothers who fend off demons, and continues to be on air today. The following year saw Warner Bros. allowing McG, who "looked to improve as a storyteller and wanted to get more substantial material," to direct We Are Marshall , a sports drama film. Although the film received mixed critical reception, McG was complimented for his ability of emotional storytelling. Jessica Reaves of the Chicago Tribune noted that "McG shows new maturity. Scenes that could have been played for ghoulish effect, like the plane crash and its fiery aftermath, are handled with skillful efficiency." At a budget of $35 million, the film only made $43.5 million. He had also produced the horror film Stay Alive , which received largely negative reception. Along with Adam Brody, McG was next set to produce a remake of the cult comedy hit Revenge of the Nerds, planned for a release in 2007 with a budget of $12.5 million and filming to begin at Emory University. However, after reviewing the script, university officials backed out two weeks before filming, citing it as "too bawdy." This led the film to be shot at Agnes Scott College for two weeks, but afterwards, Fox Atomic and producers shelved it due to the "lack of wide, open space Emory's campus would have afforded them, and winter was fast approaching, making the prospect of shooting the movie's many outdoor scenes problematic." Furthermore, studio executive Peter Rice was disappointed with the dailies. In 2007, McG worked mostly on television, producing Pussycat Dolls Present: The Search For the Next Doll and Chuck . Co-created by Josh Schwartz, his partner on The O.C., he directed the latter's pilot and continues to be an executive producer on the ongoing series. Fox had also given a script commitment to Invisible, a television pilot written by Ari Eisner about a criminal who becomes invisible he was supposed to produce, and We Are Marshall writer Jamie Linden was working with him on a TV pilot called Flash Back. However, as of 2011, there have been no updates on these shows. McG continued producing for the next couple of years. On August 2, 2007, McG signed a three-year first-look production deal for his Wonderland Sound and Vision company with Warner Bros., planning to "produce three movies a year" and directing "one of them every year." The first four films set up were Nightcrawlers , an untitled spy project, Yucatan, and Maintenance. The former, about an aberrant father who must confront his childhood tormentor to rid of his fear of monsters and the dark, was arranged to start in November 2007, but McG dropped out and was later replaced by Mike Mitchell; the untitled spy project was rewritten by Phil Alden Robinson and was to be produced by Basil Iwanyk; Yucatan, based on Steve McQueen's leftover notes and storyboards of his passion project, is an epic adventurous heist film, though Warner Bros. has now placed the project under Team Downey; and Maintenance was a film adaptation of Jim Massey's comic book series of the same name about two janitors who work for a weapons manufacturer that supply to the world's most evil super villains, but the rights of the film has moved to DreamWorks Animation. As a result, none of them will feature the involvement of McG. On October 30, 2007, Fox approved a pilot for an American remake of the British cult show Spaced, which McG served as an executive producer, even though Simon Pegg and fans were outraged at the prospect of having a remake without the original creators' involvement. Nonetheless, the pilot, written by Adam Barr, was heavily panned before its airing, resulting in Fox scrapping the series. McG then executive produced Pussycat Dolls Present: Girlicious . The Pussycat Dolls Present: series was canceled afterward. He was the executive producer for the WB Television Network's online series, Sorority Forever and Exposed , as well. McG's next film project was Terminator Salvation , a quasi-reboot of the franchise that introduces the future war fought between humanity and Skynet. After the Halcyon Company purchased the rights, they signed McG onto the project, for which he was paid $6 million. Although he promised fans that he would bring back credibility to the franchise, with the casting of Christian Bale and the personal talk with James Cameron, the film, released on May 21, 2009 in the United States and Canada, received the most negative reception out of all the films in the series. It grossed over $370 million worldwide, a moderate success given its budget, but well below industry expectations. Following Terminator Salvation, he was expected to direct a remake of 20,000 Leagues Under the Sea for Disney, for which he was interested in casting Sam Worthington for Captain Nemo. However, after spending nearly $10 million on pre-production work, Walt Disney Studios' movie chief Rich Ross put the project on hold indefinitely due to creative concerns, and McG is no longer attached. Subsequently, he went into negotiations with 20th Century Fox to direct This Means War, a spy comedy project about two best friends who go to war against each other after falling for the same girl. Though initially troubled with numerous casting dropouts, including Bradley Cooper, Seth Rogen, and Sam Worthington, the film was finally filmed in Vancouver and is set for a release in 2012. Since then, he has been in negotiations for the directing duties for Universal Pictures' Ouija and has been attached to Lorene Scafaria's pitch based on a Rolling Stone article about the true life events of Esther Reed named "The Girl Who Conned The Ivy League," along with Amanda Seyfried, and a high-profile untitled space adventure project written by David Callaham for 20th Century Fox. McG was also in discussions to supervise development and direct the fifth installment of the Terminator film series, having made a $10 million right-of-first-refusal deal with the Halcyon Company, but with the rights of the series converted to hedge fund Pacificor, his further involvement is unlikely. The film adaptation of Peter M. Lenkov's graphic novel series R.I.P.D. was another project he was circling, but because of his commitment to This Means War, he was replaced by Robert Schwentke. McG has also delved into comics with Wonderland set to publish the original Haunted City, written by Chap Taylor, that will expand into a feature film, which he plans to direct, a television show, and a video game. He has been actively developing a film adaptation of the rock musical Spring Awakening, planning to independently produce and film it in six weeks for $25 million, with additional producing duties for: a film adaptation of Jon Stock's Dead Spy Running novel that is meant to reinvent the spy genre; I Am A Genius of Unspeakable Evil and I Want to be Your Class President, a film adaptation of the book of the same name by Josh Lieb; Medieval, a film he was previously set to direct but is now being helmed by Rob Cohen; Elysium, a modern retelling of a classic Greek myth written by Matt Cirulnick for New Regency; Medallion, an action thriller starring Nicolas Cage about a former master thief on the search for his kidnapped daughter; a film adaptation of The DUFF ; Tink, a live action romantic comedy based on Disney's Tinkerbell; and CBS Films' Face It. Other projects he has expressed interest in include a World War II film and an adaptation of Do Androids Dream of Electric Sheep?, which was previously filmed by Ridley Scott as 1982's Blade Runner. January 17, 2010, and ending after two seasons. On the same year, The CW gave a series order to Nikita, a remake of La Femme Nikita, which premiered on September 9. The recent line-up of shows he's been attached to are Zombies vs. Vampires, a buddy cop series about two officers, one of whom is a vampire, that deal with "zombie crimes"; a private eye series named I, PI he co-developed with Paul Scheuring; and the web series Aim High, which is set to premiere on August 1, 2011 on Facebook. He has suffered from agoraphobia and aerophobia, notably refusing to board a plane going to Australia to shoot Superman: Flyby and subsequently being dropped from the film. His brother died of a cocaine overdose in 2007, which he says has kept his life grounded and reminds him not to take it for granted. Whole or part of the information contained in this card come from the Wikipedia article "Joseph McGinty Nichol", licensed under CC-BY-SA full list of contributors here.